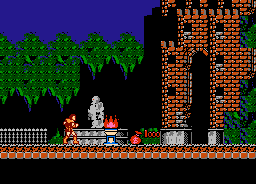 The purpose of this challenge is to give the environments of Castlevania a little love. While they do have a lot of that old school grid-like charm, there's lots of room for improvement! with a focus on design, eliminating the grid, and more organic feel, there are lessons to be learned here that can apply to modern pixel art, and even hi res 2D games. The most important restrictions being: 4 available 4 color palettes that all share one universal color (usually black), and that each 16x16 area must share the same palette. Keep in mind that the HUD needs a palette, so if you have 4 on screen, one of them needs to be shared with the hud! However, as if things weren't hard enough with just those colors to choose from, we also have a tile limit due to how this game handled graphics, says the great Kasumi ( I pleaded with him, but he didn't budge) here is your blank canvas of 128 tiles. Choose one of these screenshots to give a makeover to ( or find your own!). It can be a near 1:1 translation, or you can go nuts and do your own thing! That goes for placement, design, everything. As long as it fits the restrictions. Here is an example I put together to get the ball rolling. Mine is perhaps a bit busy, so I challenge you to show me up! Note the extra tiles left over that could be used for stairs and other things further into the level. Most of the images in my restrictions post have been dead for months, and I haven't gotten around to fixing them. I'll try to get to that. I'd recommend the NTSC palette from Bisqwit's palette generator over Nintendulator's PAL palette. 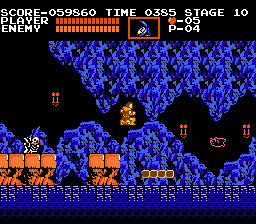 Good timing, I was just itching to do some NES mockups, though have almost zero experience with it. 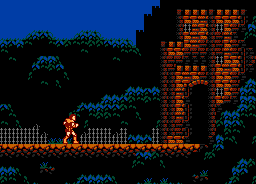 Also not a Castlevania player, just wanna pixel something nice. Here's what I've manage to do over evening. Image cropped from VGMaps. 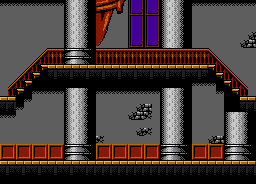 Palettes are all over the place, those diagonal stairs unexpectedly screw me over due to 16 x 16 pixel region color limits. So yeah, it doesn't follow restrictions currently. I have to rethink the whole color scheme all together. But I feel inspired, and want to play with different areas. Really excited to see how far you guys can push those graphics. 1. Does HUD also count towards limits? That's why interface and walkable platforms are constantly red/orange? HUD counts yes, but I think the 120 is already excluding the HUD (hence why it's only 120), so you don't need to worry about it. 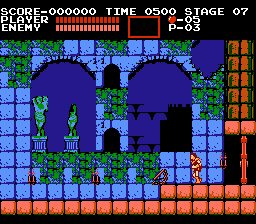 Depending on game, recolors even count, so if you have a tile and you want to use it in two separate palettes on one screen, you double it. There's plenty of ways around that though, so you can skip it if you want. No, you can switch tiles per screen, or even on scanline sometimes, depending. For this exercise, just don't mix the two and you're fine. Like, if you make outside and inside areas, and you want to mix those tilesets, you make sure the combination doesn't go over the limit. Okay, here's my second take. 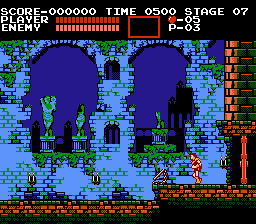 Afterwards I might take this palette and use it for castle hallway as well. Plenty of colors left unused yet. I'm happy with it so far. Can't decide on version with space in between trees or without. Obviously, WIP. Haven't felt this inspired for a long time. Would be cool to make a whole series of those. This topic seems really awesome. I'm gonna try and do a screen or two myself. Phoenix849: Awesome stuff man! I like that you stayed conservative with your tiles but still vastly improved the look. The palette change in the first area especially gives off such a stronger mood. I bet you have a good many tiles left, perhaps try to think a bit outside of the box now! Mnots: heheh, go for it! 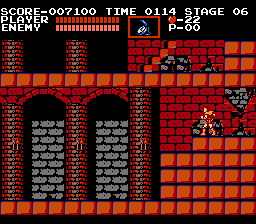 Using two separate palette to display a tile doesn't need extra tiles on NES, unless the tile would need to be "remapped". Like if you had a palette of black, brown, white. And a palette of green, dark green, light green. If you wanted to display a tile using the green palette such that dark green was used where black was, you'd need two tiles. But if the second palette were dark green, green, light green (the same colors in a different order), you would not need a second tile to do that. 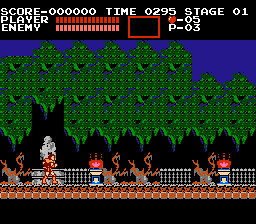 The forest and castle areas of the first level actually do use the same set of 128 tiles and palette. (Palette would be easy to change, though, they just just didn't.) I'm not saying don't use another set of tiles just because they didn't. Go for it. It's just information. The HUD does not count towards your tiles. All reserved tiles are in one half, so the 128 you get are the other half. The HUD does affect your palette choices, though. 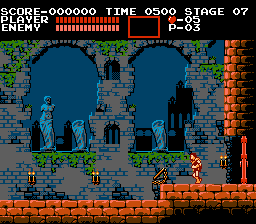 In Castlevania, the HUD always uses the same palette in every level (At least, so far. I'm beating it again to check, and I'll update this post if it changes. Edit: Doesn't change during gameplay). For your mockups, you can have a different palette for the HUD so long as it remains readable. Battletoads changes its HUD colors per level to get the most out of its palettes. 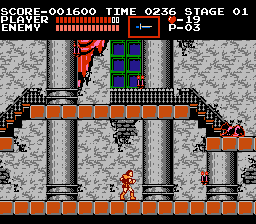 Castlevania doesn't, but it could. Basically made the tiles in the foreground big to create a sense of depth and obviously changed the colors, based on the palette in Ruymaru's original post. If I understand the color restriction correctly you have one color that can be used anywhere and four 3 color ramps where you can only utilize one ramp and the omni color in a given 16x16 area?